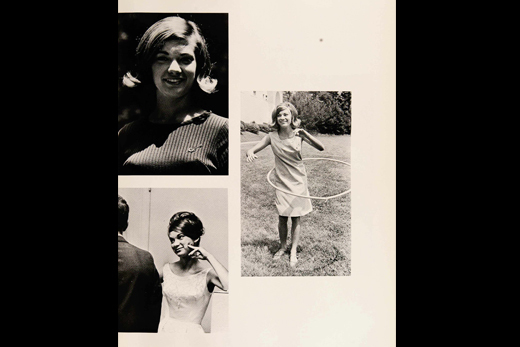 Images from the "Beauties" pages in the Campus yearbook, 1966. 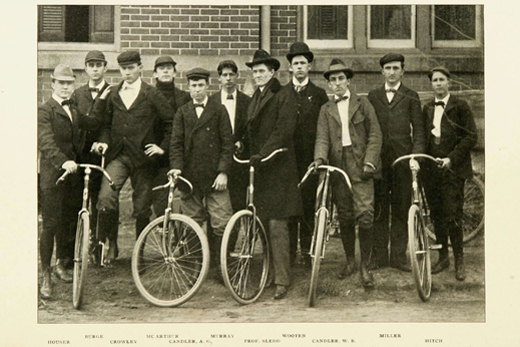 The Bicycle Club, pictured in Emory College's 1898 Zodiac yearbook. Members of the Cosmopolitan Club, from the 1920 Campus yearbook. Homecoming visitors who stop at the Robert W. Woodruff Library will find a special treat – an exhibit on the digitization of Emory University yearbooks from 1893 to 1999, with more recent years to be added soon to the archive, which is now online. 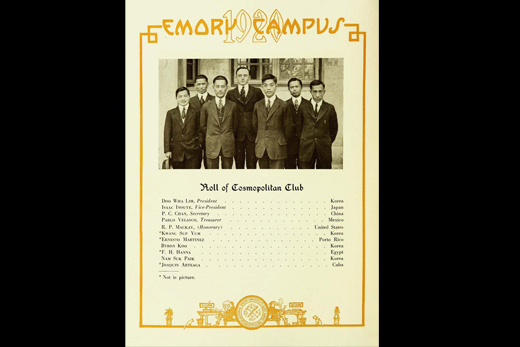 "Gone Digital: 100+ Years of Emory Yearbooks Now Online" opens Sept. 17 and will run until March 8, 2015, in the Level 2 gallery space near the Center for Faculty Development and Excellence (CFDE). The exhibit will feature a kiosk from which visitors can access the yearbooks, a narrative on how the yearbooks have highlighted various campus and societal changes over time, and an oversized image from one of the yearbooks with face cutouts so visitors can pose in the fashions of yesteryear and take pictures if they wish. Library exhibitions manager Kathy Dixson says the digitized yearbooks provide not only an easily accessible trip down memory lane, but also a valuable untapped trove for research ideas. "The collection not only records and preserves memories for students and families, but it creates a history of the university, and beyond that, a history of changes in printing and communication, education, popular culture, and even politics and economics," Dixson says. "It also shows the libraries' work to digitize the collections to make them accessible to far wider audiences." The digital yearbook archive dates back to 1893, when students at Emory College started the school's first yearbook called "The Zodiac." Other titles followed; "Campus" appeared in 1911, publishing in print until 1999 with only a few interruptions. This entire run of yearbooks, as well as medical and dental school annuals, is available online. Oxford College yearbooks are in the process of being digitized, says John Bence, university archivist at the Emory Libraries. And Emory produced a digital-only yearbook for the past three years, which will soon be added to the University Archives, he says. As it turns out, it's not only people with Emory ties who are interested in the yearbooks. A few pages from a 1950s Emory yearbook were referenced on a vintage hairstyles blog as inspiration for the blog's followers. A staff member running analytics on website pages noticed repeated hits on those yearbook pages and tracked down the source of their popularity. "These yearbooks have appeal beyond campus," Bence says.